All Night Pressure is the new voice in the So-Cal Roots Reggae scene with energetic live performances and conscious lyrics. 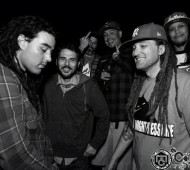 The 6 piece band has influences spanning a wide horizon of genres from Reggae, Rock, Hip-Hop, Dub, Punk, and Ska. They’ve been preforming non-stop since their inception alongside reggae legends Midnite, Humble Soul, The Wailers, Pato Banton, Black Uhuru, Sly and Robbie, and J-Boog. As a band they have released 3 albums, with their latest debut entitled “The World Gets Smaller” released July 2014. All Night Pressure is currently signed to Wright Records with distribution through Sony Records/ The Orchard. The band has brought the fire to ears, minds, and hearts of people from OC to Addis. All Night Pressure is band best experienced live with a mix of dubbing bass, vocal harmonies, rock-steady guitar licks and percussive rhythms. The group has built a large and loyal fan base and with each performance and album release they continue to win fans over from San Diego to Humboldt. Having achieved enormous underground success, with their creativity and hard work ethics All Nigh Pressure is ready to bring their music to the masses!